A piece ofspace junk orbiting Earth has forced NASA to tweak upcoming plans for the Fridaydeparture of Japan?s first cargo ship to the International Space Station. The debris,a wayward chunk of an old Russian satellite, poses no risk to the spacestation, but could be a threat to the H-2 Transfer Vehicle, an unmannedJapanese freighter making its maiden flight, after it departs Friday. 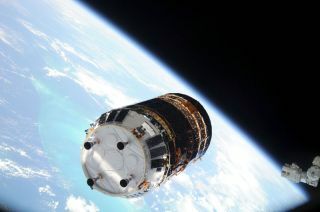 Japan?sspace agency launched the cargo ship last month and planned to undock it tomorrowat about 12:05 p.m. EDT (1605 GMT). But the Russian pieceof space debris is expected to pass through the station?s neighborhoodaround that time, so NASA opted to keep the Japanese spaceship attached to theorbiting lab for one extra orbit. It will now undock at around 1:30 p.m. EDT(1730 GMT). The spacestation will not have to fire its thrusters to dodge the space junk. Delayingthe HTV-1?s departure will ensure that the unmanned spacecraft will be safeafter it leaves the station and enters a different orbit, NASA officials said. NASA typicallymoves the space station if the odds of a space debris impact are within a1-in-10,000 chance. The agency also likes to keep a box-like buffer around thestation free of any debris. That safety zone extends about 15 miles (25 km)around the space station, as well as about a half-mile (0.75 km) above and belowit. The station flies in an orbit about 220 miles (354 km) above Earth. The Russiansatellite debris will not encroach within that perimeter, NASA spokespersonKelly Humphries told SPACE.com. ?Theytracked it for a few days and determined it was going to be outside what wecall the pizza box, and that the station will be safe,? he said. ?They justwanted to give HTV the same courtesy.? Spacedebris has been a growing threat for satellites and crewed spacecraft in orbit.Earlier this year, twocommunications satellites collided to create two vast clouds of space junkorbiting Earth. China also added to the debris mix in 2007 by intentionallydestroying a satellite in orbit during an anti-satellite test. Someexperts have said the more than 20,000 objects being tracked by variousagencies today already represent a serious threatto satellites and other spacecraft. They have called for a renewed push tolimit the amount of junk from new satellites and develop clean-up measures forthe orbits near Earth. Japan?sHTV-1 cargo ship launched to the space station on Sept. 10 and arrived on Sept.17 after a smooth shakedown cruise. The vessel is the latest in a series of disposableunmanned international spacecraft to deliver supplies to the space station. Thespacecraft is due to undock Friday with nearly 1,600 pounds (728 kg) of trashand then plunge into the Earth?s atmosphere on Sunday to be intentionallydestroyed over the Pacific Ocean.